The need to upgrade facilities or improve business processes are some of the major decisions that may eventually fall on your lap in the course of running your own business. But once you’re convinced that an upgrade (facilities, equipment, or technological) could improve your production or offer significant savings, it’s easier to decide to make a go of it. However, you might decide to put off your plans until you have saved enough money. There is nothing wrong with delaying an upgrade until you have raised enough funds but there could be lots of opportunities you might be missing out, including the potential to increase earnings. Many proactive business owners strike while the iron is hot, seizing opportunities when they spot one. Right now could be the opportune time for you to strike, but issues like huge capital outlay in one go could be your major stumbling block. On the other hand, you may have the necessary cash for an upgrade but you would rather spend it first on settling payroll, marketing programs, and working capital requirements. Again, you have shelved your plan to upgrade. In both cases, it could make more sense to turn your sights to external business loan financing. That way you don’t have to wait months or years saving up for an upgrade. You don’t have to worry about expending huge sums all in one go, leaving your business vulnerable to cash flow issues. Apart from traditional SME loans in Singapore, commercial lease and hire purchase schemes are examples of financing instruments that allow you to utilize assets to further your business while managing your business cash flow by regularly paying off smaller, manageable amounts. In a nutshell, commercial lease involves two parties, the lessor who owns the asset and the lessee, the one who uses the asset. The lessor grants the lessee the right to use an asset in exchange for lease rentals he’ll receive from the lessee. On the other hand, the main parties to a hire purchase scheme are the financier who buys the asset, and the hirer (the business owner) who agrees to pay on installment the cost of the asset purchased including interest. The hirer can use the asset immediately upon execution of the hire purchase contract. While both financing schemes are considered asset based lending and offer the opportunity to utilize an asset without necessarily releasing huge amounts of cash in one go, there are distinct differences which may help you decide which scheme would best match your current and future business requirements. In a commercial lease, the lessor merely grants you, the lessor, the right to use the asset. You don’t have the right to own it even if the total amount you’ve paid over time has reached its cost. The reverse is somewhat true of a hire purchase transaction. Under this scheme, you, the hirer, are given the option to acquire the ownership of the asset provided you have fully settled all instalments due and satisfied other conditions indicated in your hire purchase contract. Your debt level won’t be affected even if you have entered into a lease agreement. As the lessee, you won’t be reporting any liability in your books. Since it is an off-balance sheet type of financing, it may present a positive effect on some commercial loan ratios used to measure business performance. Outstanding lease is not reflected as a liability in your balance sheet but is written off as expenses in your profit and loss statement. As such, a leasing arrangement might offer potential tax benefits and serves to ‘window-dress’ the books since it’s technically not recognized as a liability unlike hire purchase. As a hirer under a hire-purchase transaction, you record your instalment dues as part of your current liabilities. Commercial lease transactions usually involve renting out the land, buildings, aircraft, and other assets with longer, useful lifespans. Whereas hire purchase agreements are typically used to document the use of assets with lesser value including equipment, machinery, and land vehicles. There are usually no upfront payments required in a commercial lease because the asset won’t be conveyed to you. However, you may be required to make advance payments or deposits – typical requirements of a lessor. As for hire purchase, the financier would normally ask you to pay upfront up between 10 to 30 percent of the purchase cost of the asset. In effect, you are partially financing its acquisition. As a lessee under a commercial lease, you don’t claim depreciation. The reverse holds true in a hire purchase arrangement. Again, from a tax perspective, this might not be an incentive as although depreciation can be offset against net profits of the company, the corresponding monthly leasing instalments also serve the same effect as an expense in the books. Under a commercial lease, you aren’t tied to the asset you are leasing. You are simply utilizing it and the lessor remains as the rightful owner. At the end of the contract, you simply turn over the property to the lessor or ask for contract renewal. Given this, there is zero risk of ending up with owning a property that may soon become obsolete. It offers you more freedom to utilize a more up-to-date equipment. With a hire purchase agreement, you usually acquire the rights of asset from the financier at the end of the hire purchase term. There’s a risk of being tied to an asset that is nearly outdated and has very low residual value. For this reason, a hire purchase agreement isn’t a popular financing scheme when acquiring potential assets that depreciate fast or becomes obsolete rapidly with technological advancements. Examples of such assets would be like office copiers, fax machines, desk phones, personal computers and the like. If your business relies on up-to-date equipment, leasing is a good scheme as it allows you the flexibility to implement equipment asset upgrades from time to time. 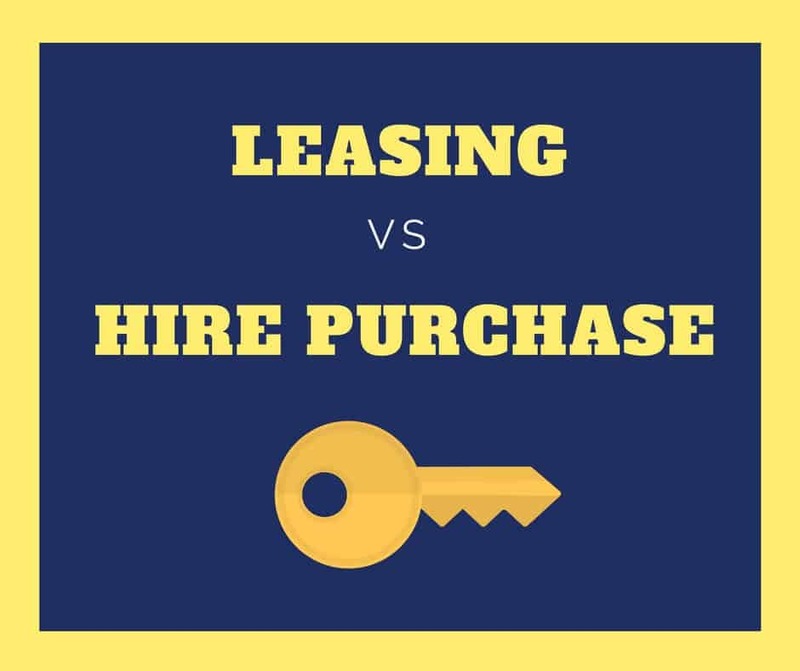 However, if a particular equipment has a long, useful shelf life and you plan to utilize it for years on end, leasing may be costly and a hire purchase arrangement could be a more beneficial approach. If the equipment or machinery has a significant residual value in the resale market, it will also make sense to opt for hire purchase financing since you can have the option to re-sell the used equipment in the secondary market at the end of the hire purchase term. Examples would be commercial buses or coaches, construction earth moving equipment such as bull dozers and excavators. It is increasingly harder to access financing in the economic slowdown and SMEs should consider all viable alternatives such as hire purchase or leasing as an option. There are many other creative business financing options aside from traditional SME loans you can tap onto. You may also have other deal breakers in mind but no matter if you decide on a hire purchase or leasing options, just make sure that it matches your business needs down to a T.